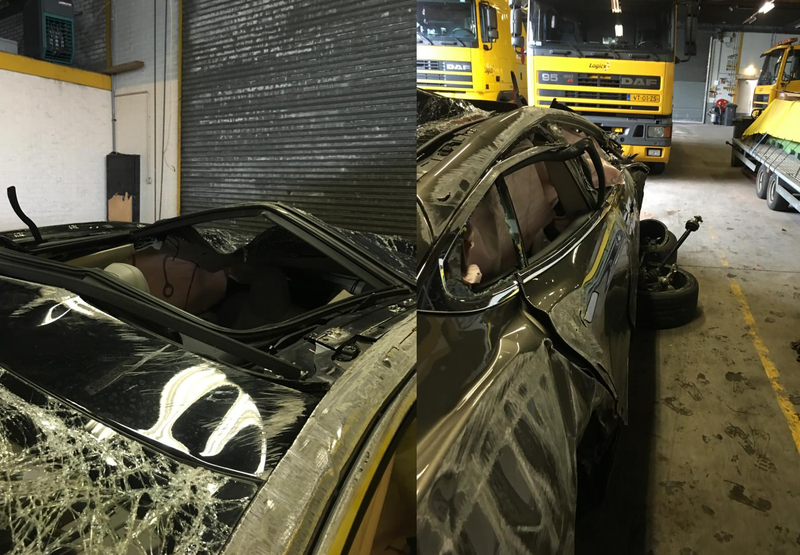 Last week, we reported about a Swedish Tesla Model S involved in a serious accident in The Netherlands. According to Dutch news outlets, the car collided with a truck on the highway and rolled over, landing back on its wheels. The driver had to be taken to hospital, however there were no reports on how the accident happened and if the driver - or other passengers - were seriously injured. The truck was slightly damaged but was able to continue its journey. Today, we learned that the driver in question has survived the accident - along with his son - with very minor injuries. Electrek.co was able to track down the driver and share his side of the story. The driver first published his recollection of the incident this morning on Tesla Club Sweden forum. We spoke to Ludvig, from Sweden, who was on a "Tesla road trip" with his 8 year old son, starting from Stockholm, through Denmark and Germany, all the way to the Loire Valley in France. When they set out their journey back home, Ludvig recollects stowing away securely all their belongings - including French wine, Jeux de Boules balls, and books - in the trunk the night before entering the Netherlands. Just before noon on June 29, they stopped at the Supercharging station in Eindhoven before making their way on highway A2 via Amsterdam to visit Walibi Holland amusement park in the province of Flevoland. Ludvig turned off Autopilot before getting on the A2 and maintained the speed limit of 130 km/h, staying in the middle lane of the 3 lane highway. The last thing he recollected is getting knocked out by the car's giant airbags after exit 27 as the car went on its left side, scraping the asphalt and rolling over 2.5 times until it came to a complete halt. Since this was a frontal collision, neither the steering wheel's nor the glove compartment's air bags were deployed. 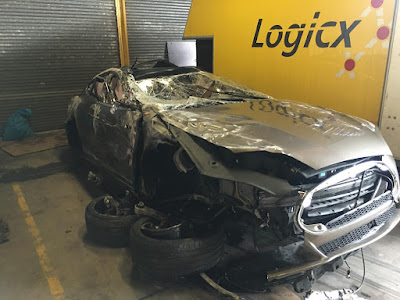 The father was able to open the driver's door and get his son out, he sustained a superficial wound on his left elbow which needed 5 stitches and his son ended up having a band aid on his foot due to a broken iPad during the crash. Nobody approached the vehicle before the fire brigade said it was safe. I had sent a helpful guy to tell them that it was an electric car, and that nobody was left inside of it. Nothing was burning. There were no smell of gasoline or diesel. The police informed Ludvig afterwards that the truck driver was trying to overtake a slower car in front of him and did not see the Model S when changing lanes, thus triggering the car to tip to its left and roll over multiples times. The truck driver was in complete shock after witnessing the accident. His testimony of events matched Ludvig's, said the police. Two out of three lanes of the highway had to be closed, causing a 25 minutes traffic jam. Eventually a tow truck was able to take the car away and the road was cleared by 2:00 pm. After checked for internal injuries and concussions, the family was released from the hospital the next day and was able to fly back to Stockholm. Back home, Ludvig was able to assess the damage on the car, which was left behind in the Netherlands. This is what he had to say. Tesla have built a car that can take extraordinary forces. The bounces off the roof were violent. The entire passenger side of the car has been torn. The wipers must be replaced, and I doubt that the sunroof can be repaired. The cage and driver environment was intact on the inside. I could open the trunk using the touchscreen. It was unscratched. Later, I saw that Tesla called my cellphone just seconds after the airbags deployed. Tesla has declared the vehicle a total loss due to irreparable damage. At their own initiative, they’ve emptied the car and sent our belongings back to us. They have called and asked how we’re doing. Several times. This car saved my life and my son's life. Goes to show that the Model S is indeed a very safe car thanks to its aluminum body and rapid deployment of its air bags, not to mention it doesn't run on combustible fuel. Featured images of the accident site: Gabor Heeres / SQ Vision. Other images are published with explicit permission from the owner. Well, of course. This wasn't an autopilot issue. So why did the wheels fall off? I reckon the story is more Tesla BULLPLOP. The wheels went whompy and that's what CAUSED the crash.